Readers of this blog know we're big fans of 'big' full throttle forward fruit filled wines such as Australia Shiraz and California Cabernet Sauvignons. Next to Bordeaux, these are the next two largest regions in our cellar that together comprise sixty percent of our collection. The only Spanish wine out of the thousand plus selections is this one, which we collect annually. Ironically it's thirty percent Cabernet Sauvignon and is the result of collaboration between the Spanish Gil family and Australian Chris Ringland, producer of big Aussie Syrahs (Shiraz). 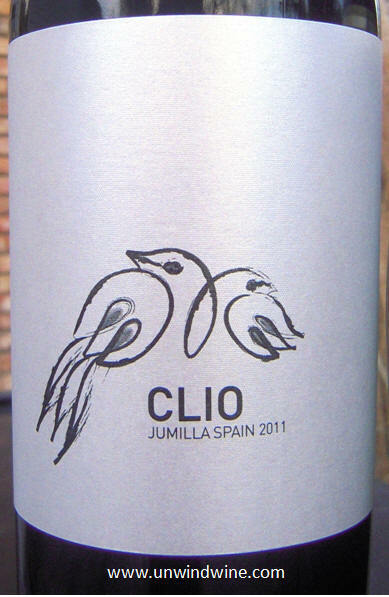 Clio is 70% old vine Monastrell and 30% Cabernet grown in the Valle de la Aragona in the Jumilla appellation of eastern Spain. It is barrel-aged for 22-26 months in French and American oak. So it's not surprising perhaps that we love this wine. We're drinking this 2011 current vintage release rather than our earlier or earliest vintages as we normally would to see how we like it to judge whether we should buy more. It good and enjoyable but not as delectable as some of its higher rated vintages. We'll gather a few more to maintain our 'vertical' collection to taste and compare over the decade or so. Looking back over the last half decade, Clio has consistently received 90+ ratings from Robert Parker's Wine Advocate: 2003 - 96 points; 2004 - 97 points; 2005 - 95 points; 2006 - 95 points; 2007 - 94 points, 2008 - 94 points, 2009 - 90 points. Our rating for the 2009 was 91 points. This 2011 Clio once again is big, full bodied, concentrated forward fruit flavored wine. Dark garnet colored, less polished than some recent vintages with a slight 'tinny' edge, the dark black and red berry fruits give way to cassis, anise, and a layer of expresso with moderate acidity, medium plus tannins and high alcohol on a long full finish.